Introducing the new Biore Uru Uru 2-in-1 Instant Foaming Wash! 2 STEPS IN 1! REMOVE AND CLEANSE AT THE SAME TIME! CONVENIENT AND TIME-SAVING! This foam wash targets young mothers and PMEBS (Professionals, Managers, Executives, Businessmen), especially for working adults like me! Convenient & Gentle: Just 3 pumps to remove light makeup, dirt and sebum in 1 step! 8x denser foam ensure close contact with skin and pores with minimal harsh cleansing motion. High cleansing ability: Contains 800% more micro bubbles to penetrate into pores to remove all traces UV, light makeup, dirt & sebum thoroughly. My Face: BB Cushion Foundation, Concealer and Eye makeup (eye shadow & waterproof eyeliner). 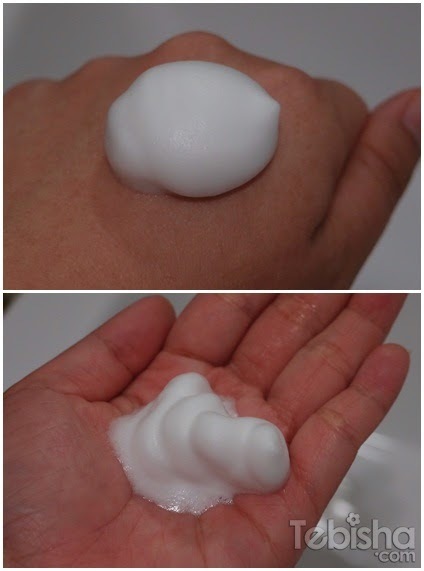 Cleanse your face in circular motion and make sure the foam close contact with the skin and pores. Do take note that Biore Uru Uru 2-in-1 Instant Foaming Wash removes only light makeup (includes face powder, liquid foundation, BB Cream, blusher, eyebrow pencil, lip gloss, sunblock). I tried to use it to remove my eye makeup but it does not remove waterproof makeup (such as eyeliner, mascara, fake lashes). My eyeliner stains to my under eyes after using it. But it effectively clean my face makeup with foundation and blusher. I have removed my eyes makeup with a separate eye makeup remover. A closer look on my cleansed face using Biore Uru Uru 2-in-1 Instant Foaming Wash. Using Biore Uru Uru 2-in-1 Instant Foaming Wash really saves my time after a tiring day at work. I don’t have to use makeup remover then cleansing foam to remove my light makeup with just 1 step, my face cleansed and moisturized! ‘LIKE’ Sample Store’s Facebook & Instagram – 10 lucky winners will bring home Biore Uru Uru 2-in-1 Instant Foaming Wash! Biore Uru Uru 2-in-1 Instant Foaming Wash is only available in Watson at $14.90 per bottle.